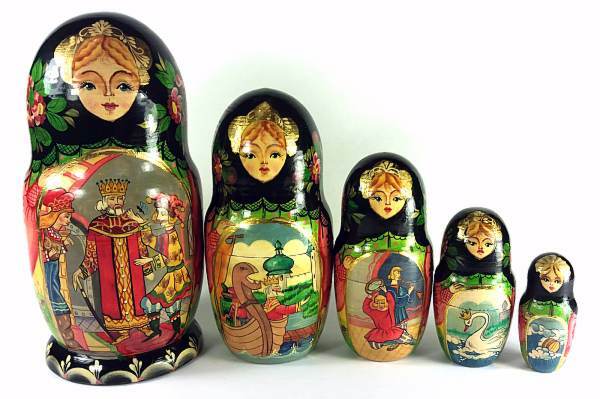 The Tale of Tsar Saltan is depicted in this 6 inch 5-piece nesting doll. Nice details throughout, starting with the little bee (Prince Gvidon) in the largest doll. Everything is hand drawn and hand painted, and the doll undoubtedly took many hours to do. The colors stand out nicely against the black background at the top and the back. The artist signed it with his initials at the bottom (M.M.) and wrote "Rossiya" (Russia). Great looking doll and excellent value.